The formal announcement that an AHL team will be playing in St. John's this fall started Friday with an informal ball hockey game at the centre that will host the new team. 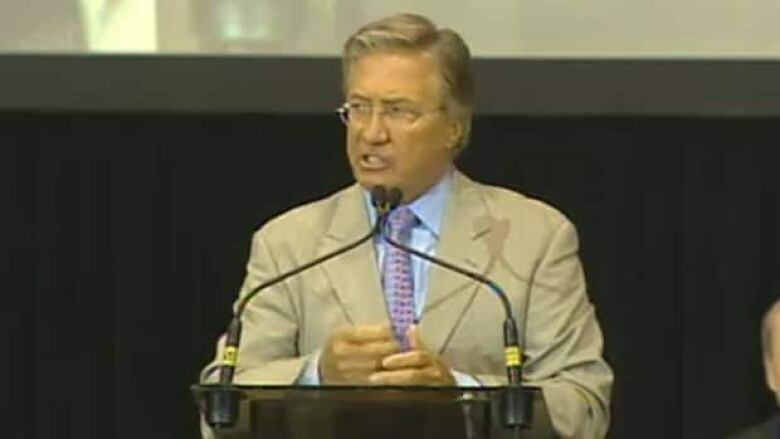 Former premier Danny Williams confirms AHL team in N.L. Former Newfoundland and Labrador Premier Danny Williams, one of the driving forces behind efforts to bring professional hockey back to the city, was joined by Craig Heisinger, the director of hockey operations and assistant general manager of Winnipeg's new NHL franchise. "We got it. We got the AHL back...I couldn't be happier," said Williams Friday morning. It's the exact phrase Williams used on Jan. 29, 2005, the day after Williams brokered a deal in Ottawa that revamped the Atlantic Accord, and brought at least $2 billion to the provincial government. Williams arrived to a triumphant round of cheers from supporters at the St. John's International Airport. He pumped his fist into the air and yelled, "We got it! We got it!" Williams will operate the as-yet unnamed team, which will be owned — at least for now — by True North, which is moving the Atlanta Thrashers to its home city of Winnipeg. Allan Hawco, of CBC Television’s Republic of Doyle, musician Alan Doyle, of Great Big Sea, comedian Mark Critch, of CBC's This Hour has 22 Minutes, and Newfoundland NHL player Luke Adam all took part in a ball hockey game at the new team’s official launch at the Mile One Centre in St. John’s. Hundreds of people were on hand at the arena to watch the game and hear the official announcement. In early June, St. John's city council unanimously endorsed a tentative deal with Williams to relocate the Manitoba Moose from Winnipeg to St. John’s. St. John’s municipal government said it is not willing to use taxpayers money to help the team. "We are not prepared to subsidize hockey with taxpayers' money, and this agreement will reinforce that and this agreement will endorse that," said Mayor Dennis O'Keefe, on June 2, shortly after council approved in principle a plan to set up an American Hockey League franchise at Mile One Centre. City Coun. Danny Breen, who chairs St. John's Sport and Entertainment, said those days are well in the past. Williams worked out a tentative deal with St. John's Sports and Entertainment in early June, after a request to the Newfoundland and Labrador government for a $500,000 annual travel expenses subsidy was rebuffed in May. Terry French, the provincial minister responsible for tourism and recreation, said the government's decision — which it said was based on a policy of not subsidizing professional sports – had nothing to do with the man behind the proposal.